Confined Space Rescue Stretcher, designed for rescues where space is confined. This confined space splint rescue stretcher is only 19 inches wide, allowing it to fit into narrower spaces. ✔ With steel, all-welded rigid construction, which does not rely on the injured person to attain form or rigidity. Light in weight and ample in size. 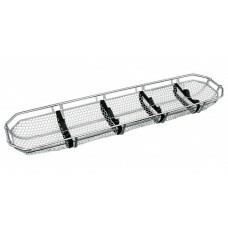 ✔ The basket is 18 gauge, 1” hexagon mesh netting. Nylon web straps for securing at chest, abdomen, thigh and calf. ✔ Supplemental accessories to facilitate special handling needs are available. JUNKIN PLASTIC STRETCHER Ideal for unusually rugged rescue situations such as industrial, min..
BREAK-AWAY PLASTIC STRETCHER The same construction as JSA-200 except it is a break-apart stre..
JUNKIN LIGHTWEIGHT BASKET TYPE STRETCHER The Junkin Safety JSA-300 basket type stretcher is a.. BREAK AWAY STRETCHER The Junkin JSA-300-B break away rescue stretcher is designed to rescue inj..
JUNKIN LIGHTWEIGHT BASKET TYPE STRETCHER WITHOUT LEG DIVIDER A lightweight basket stretcher, ..
JSA-20 JUNKIN NEC-LOC EXTRICATOR COLLARS Two piece design extrication collar, with front..
JSA-18-20 INFLATABLE SIX SPLINT KIT For immediate first-aid treatment of sprains, fractures, ..
JSA-363-BF JUNKIN HEAD IMMOBILIZER The head immobilizer is vinyl coated and is both buoyant a..
JSA-900 JUNKIN FLAT BREAK-AWAY STRETCHER This breakaway stretcher is easily separated wi..
JUNKIN CIVIL DEFENSE SPLINT STRETCHER KIT Includes a JSA-300-A Basket Stretcher. ✔ ..